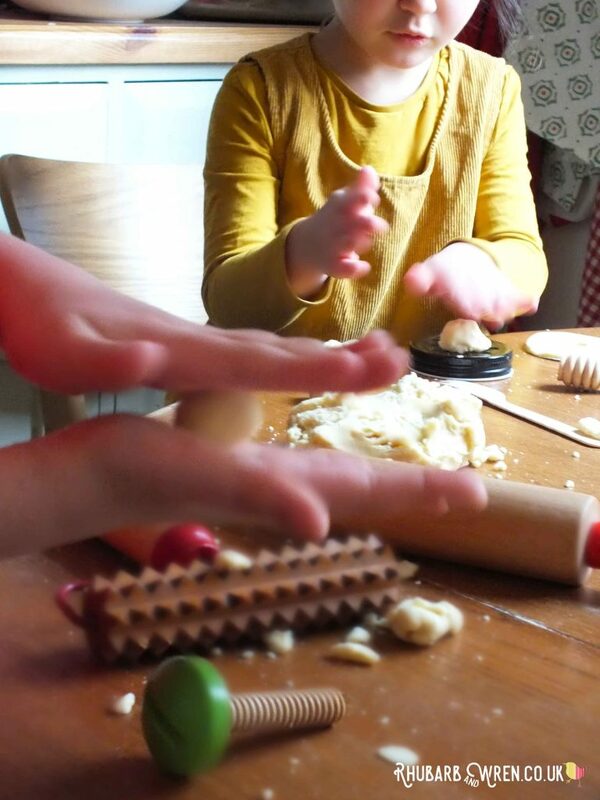 Play dough is such a great material for even very young babies and toddlers (under supervision, of course) to explore – giving kids the opportunity to investigate sensory stimulus such as texture, temperature, colour, and scent, as the dough is pulled apart, crumbled, squashed, and moulded back together. And this simple play is great for building muscles in little hands, that are later used for fine motor control and tasks such as writing and drawing. When you start adding tools, toys and craft materials to the play, a whole world of imaginative possibilities open up as well. 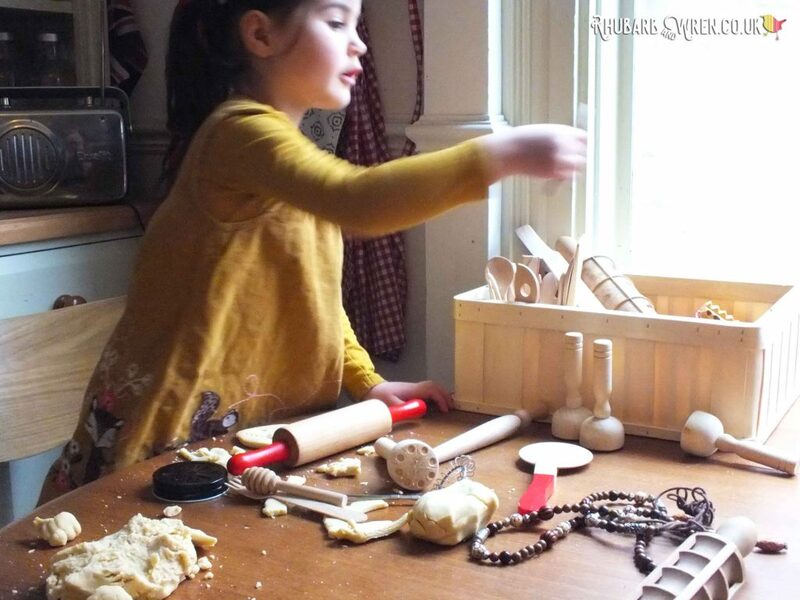 Home-made play dough and a plastic-free box of accessories and tools. It seemed a shame that the toys designed to go with this very organic material were so unforgivingly plastic and often very specific (and therefore limiting) in their designated purpose. And while the kids did have lots of fun with these, I wanted to give them accessories and tools that were more complementary to the organic nature of the play dough, more geared towards open-ended play, and at the same time helped us towards our goal of reducing down our plastic use. And all this without spending a fortune. 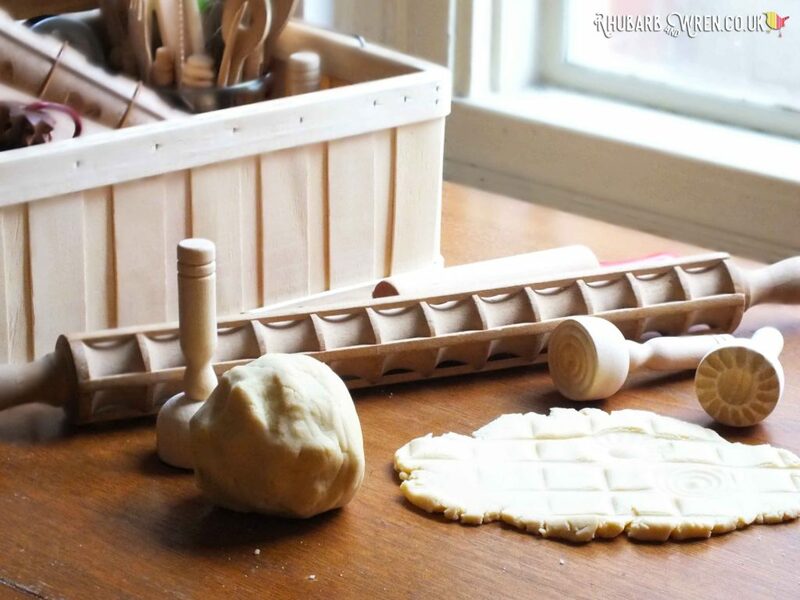 If you have ever put together a treasure basket for your babies, then you’ll have a good idea of how you can create a collection of great play dough accessories from everyday objects found around the home. 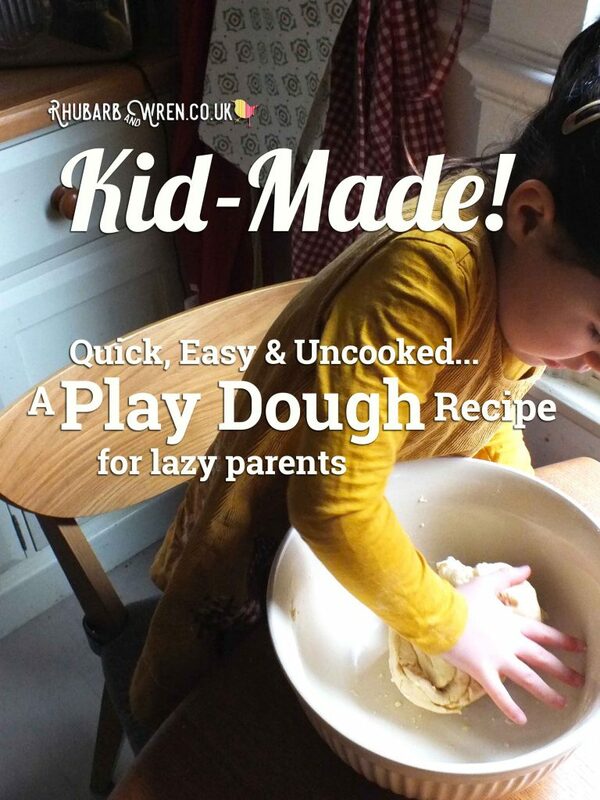 When you are hunting down items, start by thinking about the basics of how kids interact with the dough and go from there – so look for things that could help them cut, mould, print, shape or decorate the dough. 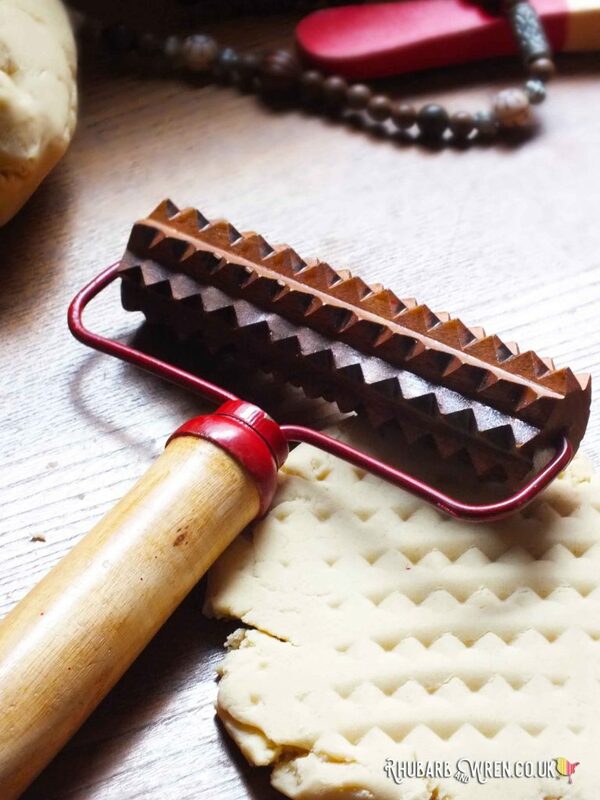 The kitchen drawer is always a treasure trove of items – and as home-made dough is made out of ordinary edible store-cupboard ingredients, a quick wash after play is all anything will need to go back into normal kitchen duty. 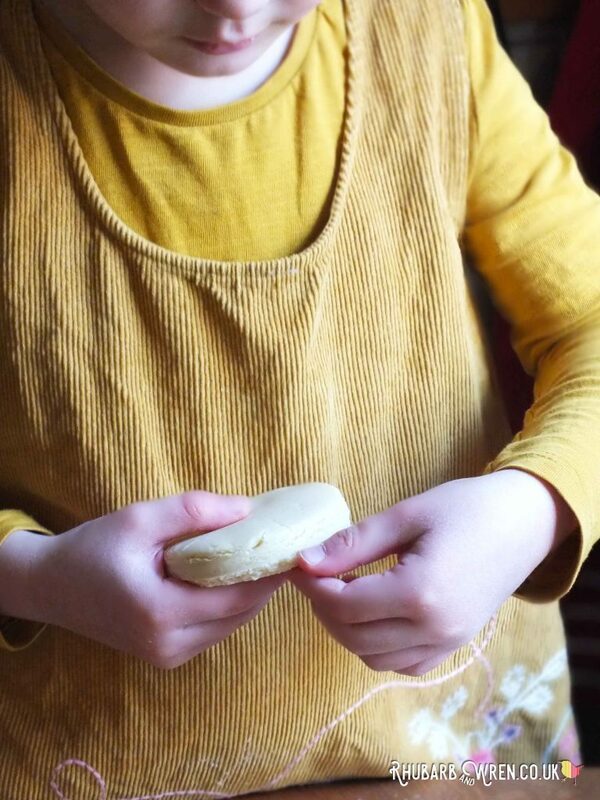 A vintage butter pat from the kitchen makes great play dough patterns. 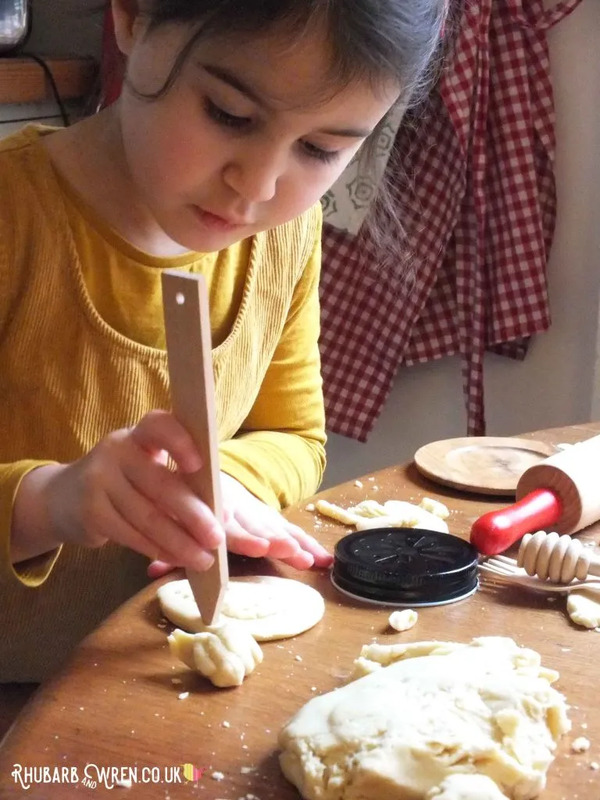 I also raided the kids’ own kitchen supplies – those wooden and metal mini pizza cutters, spatulas, spoons and knives that came with their pretend-play food works just as well (possibly even better) when carving up or making prints on play dough, and are sized perfectly for little hands. And of course it can go back into their kitchen once done with as well. If you don’t want to use your own kitchenware, though, you can easily pick up cheap bits and pieces from charity shops and jumble sales. Creative chaos! Play dough is great for practicing fine motor skills. ​I love a good trawl through my local charity shops, and have picked up some great bits and bobs from there over the years. 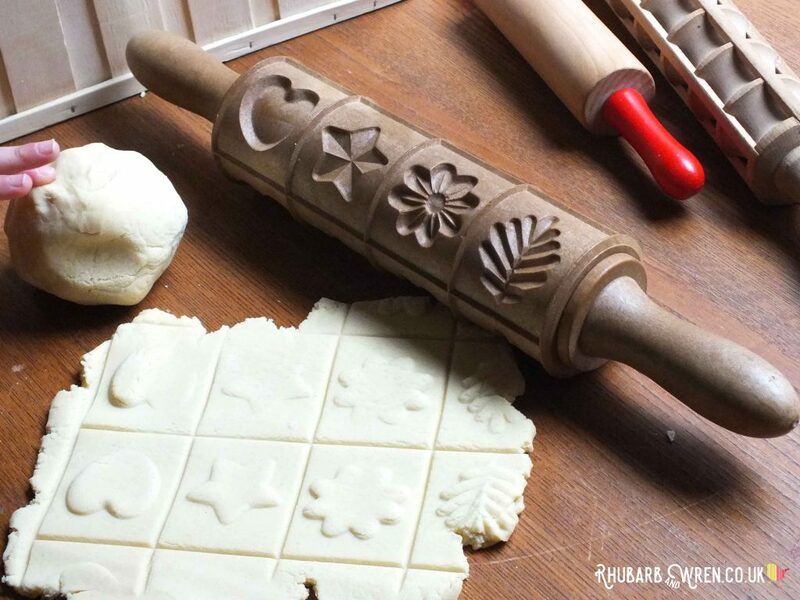 These patterned rolling pins were a particularly great find, and the kids love using them to print onto the dough, and also trying to guess what their original purpose was (I’m still struggling to figure out that for one of them myself!). Patterned rollers print just as well in play dough as real dough! They are quite pricey to buy new, but you can make your own unique patterned rollers by wrapping a smooth roller in elastic bands or by sticking on wooden craft shapes or buttons. As a bonus, home-made textured rollers are also great for painting with! Charity shop finds are the best! 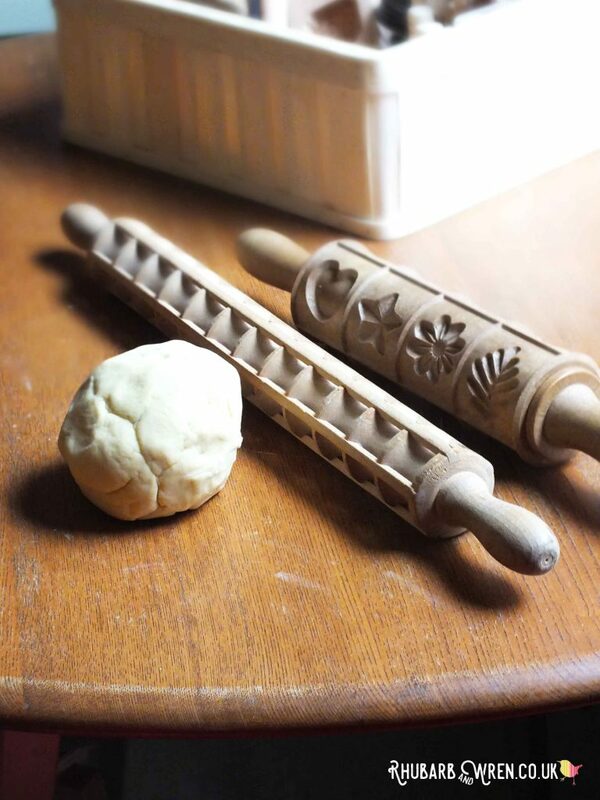 This acupuncture massager works wonders on play dough! 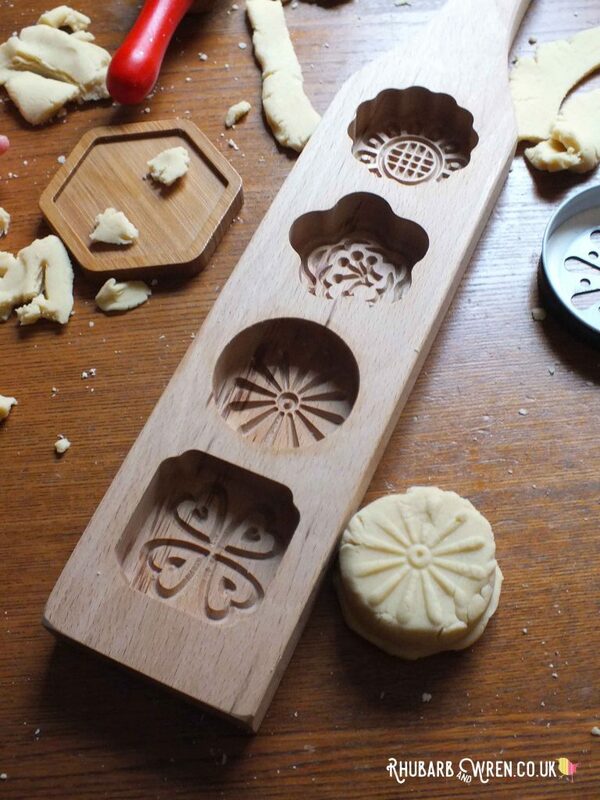 My all-time favourite find is this (affiliate link alert) amazing wooden moon cake mould. 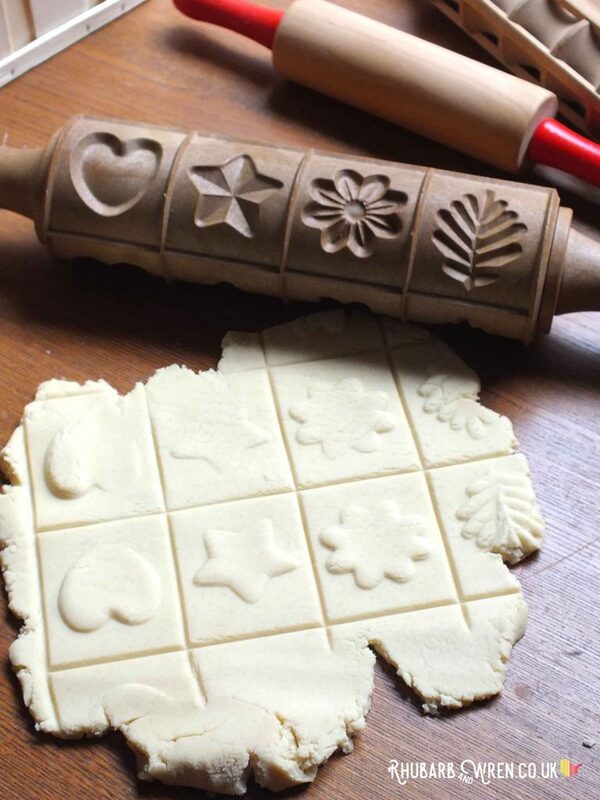 This is so satisfying to use as pushing a ball of dough into each hole creates a completely different shape and pattern. 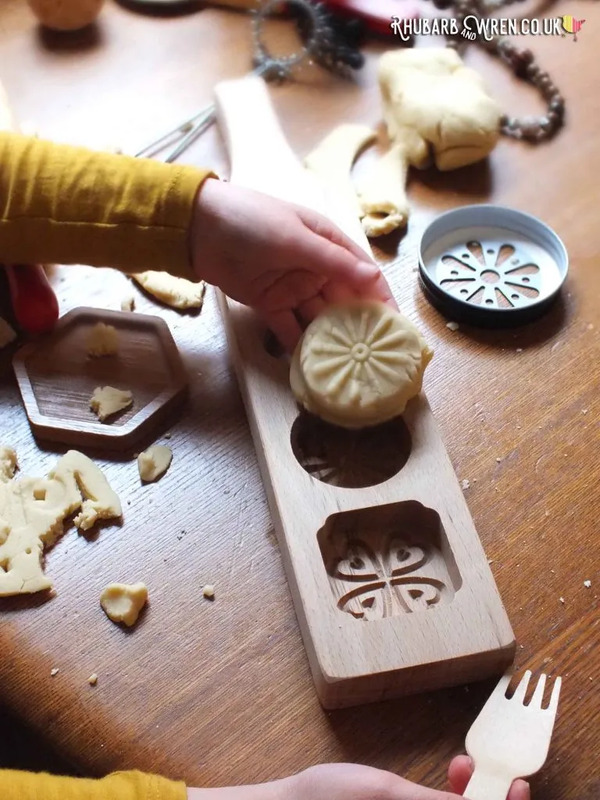 These moon cake moulds come in all different shapes and sizes – I found our one on Amazon along with a whole host of others. Obviously, buying them new is not the cheapest option, but then again you’ll be able to make lovely moon cakes with them too! 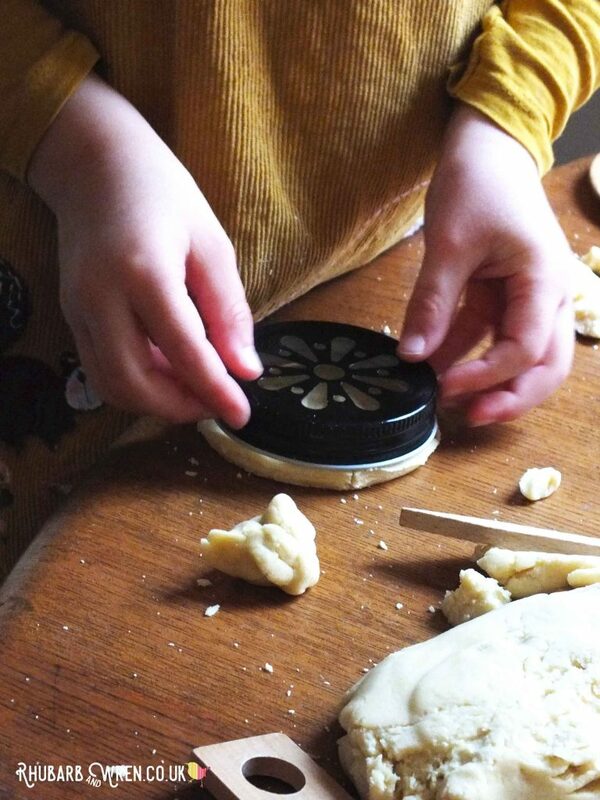 Lids of all sorts work really well with play dough, and can be used as cutters, dishes, props and even for pattern making – these daisy pattern mason jar lids, for example, can be used for all of these purposes and also make fun extruders when the dough is pushed through the pattern holes. Whatever it is that my kids are doing with their play dough, at some point there will come the need for a ‘precision tool’, so a cheap set of these wooden pottery sculpting tools has replaced the plastic versions we had, that often come with play dough sets. In the pot with them are random items like whisks, dolly pegs, lemon reamer, honey dipper, plant marker and garden dibber… just to name a few. 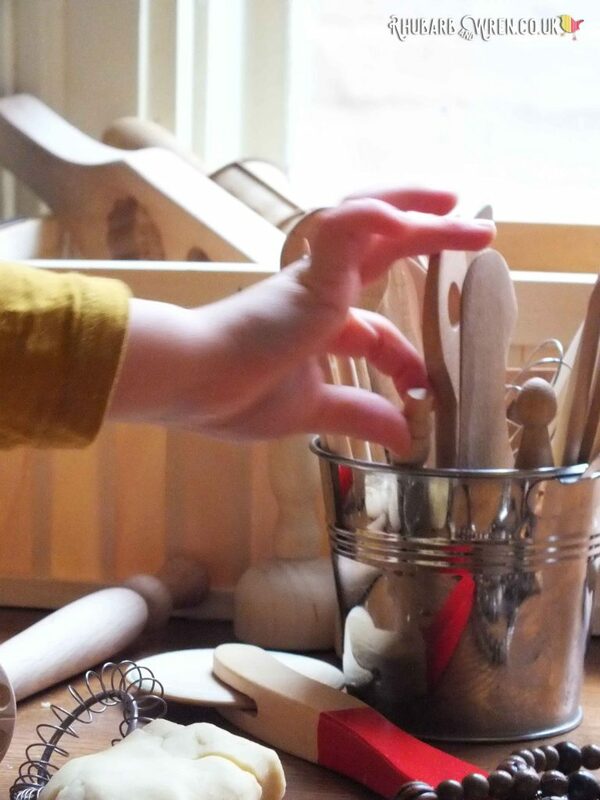 Wooden pottery tools instead of plastic kid versions. 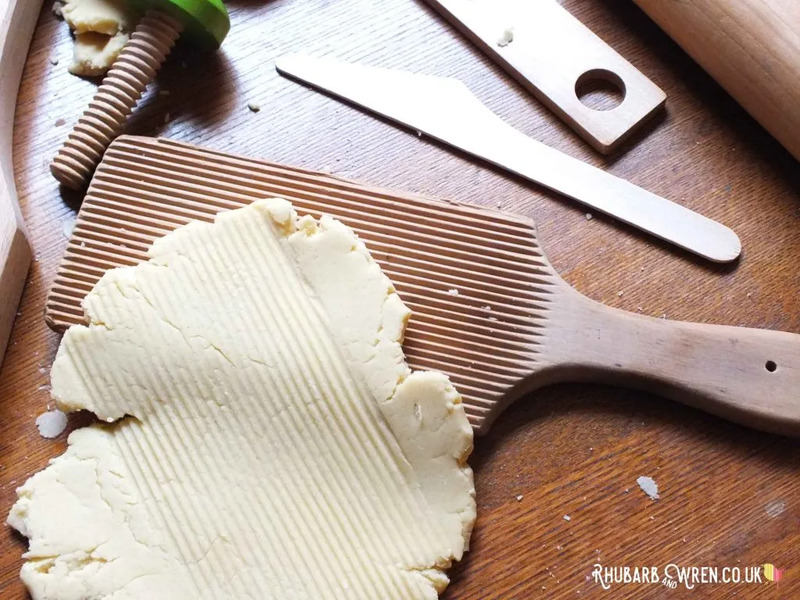 Using a garden marker as a dough marker! 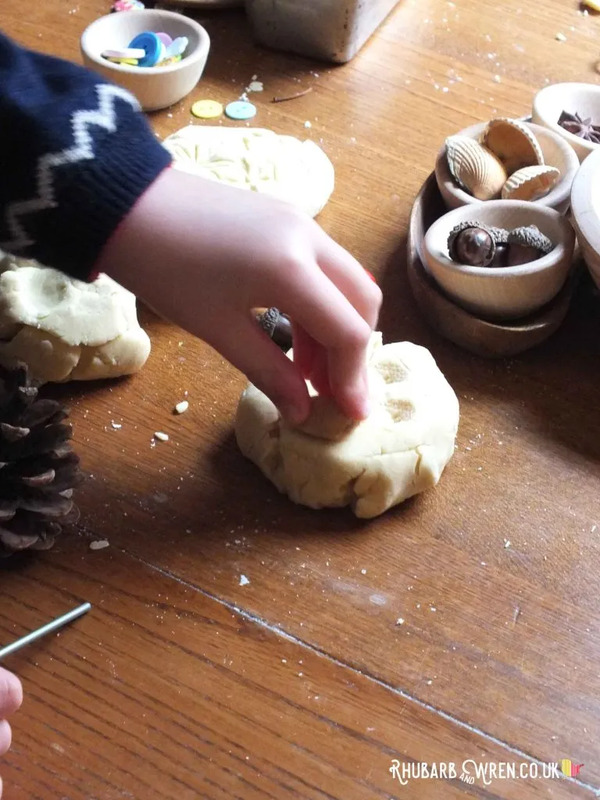 As well as pattern making and moulding items, keep an eye out for things that can be used to decorate and embellish their play dough creations too. This could be as simple as a handful of dried spaghetti, rice or pasta shapes, or some paper straws, feathers, pebbles, buttons or marbles. One of the million uses for buttons that don’t involve clothes! 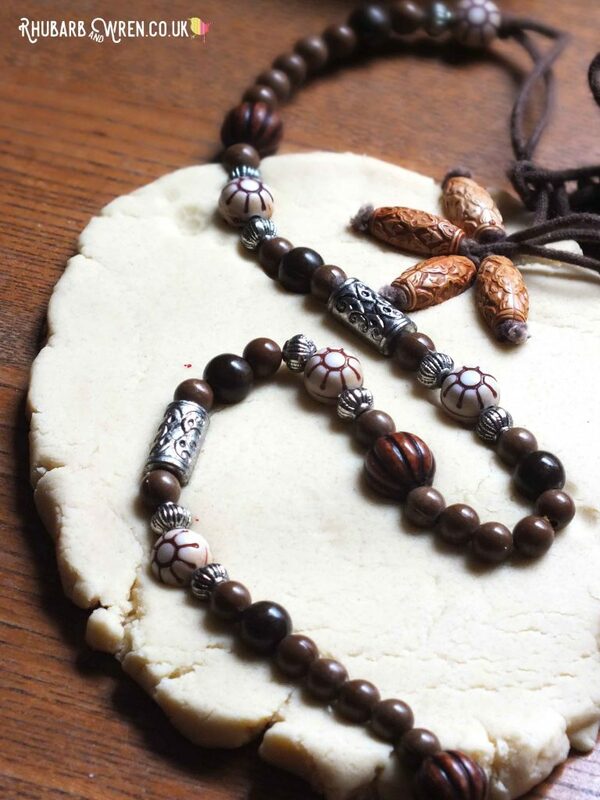 Another of the kids’ favourite items for playing with is my necklace of wooden and metal patterned beads. This was one of the regulars in their treasure basket as it has great textures for little hands to explore. It works equally well pressing patterns into the dough, and unlike many of the other things they use, it’s flexible so can be arranged into all sorts of shapes. Any type of necklace works well for this – you don’t have to use textured or patterned beads. 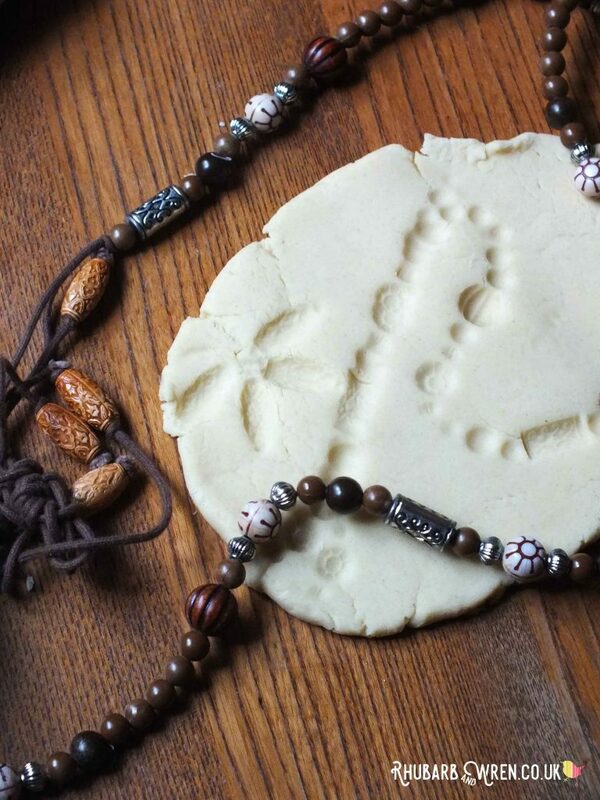 Necklace imprints can be different every time. Playing with natural materials like wood and metal rather than plastic is great not only for the environment but also gives the kids a richer sensory experience as they play. But don’t stick to manufactured items ​​​- you can find some great nature-made play dough accessories too. 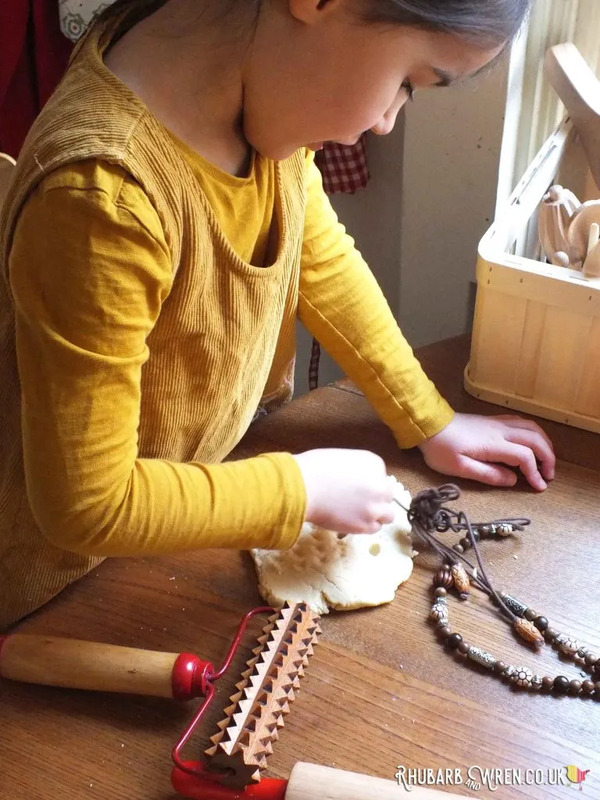 Once again the kitchen is a great place to find things to use with the play dough – dried pulses and spices, pasta of all shapes and sizes, and even fruit and vegetables can all make great tools for marking and moulding. 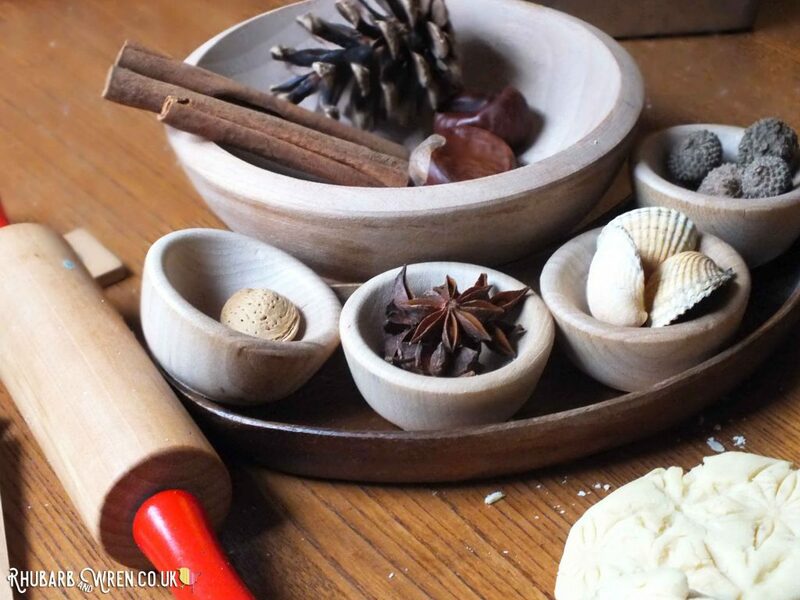 Natural materials like nuts, seed, spices and shells are all great to use with playdough. 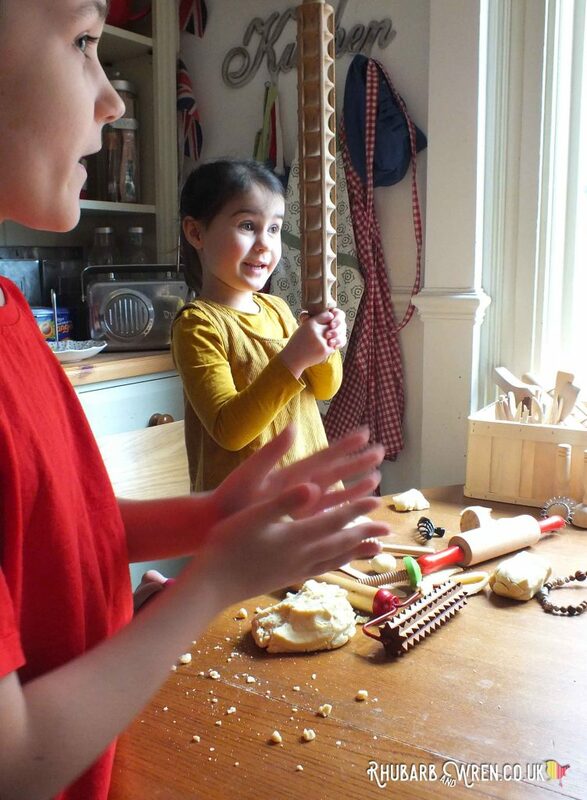 The natural world is a great store cupboard of play dough tools. 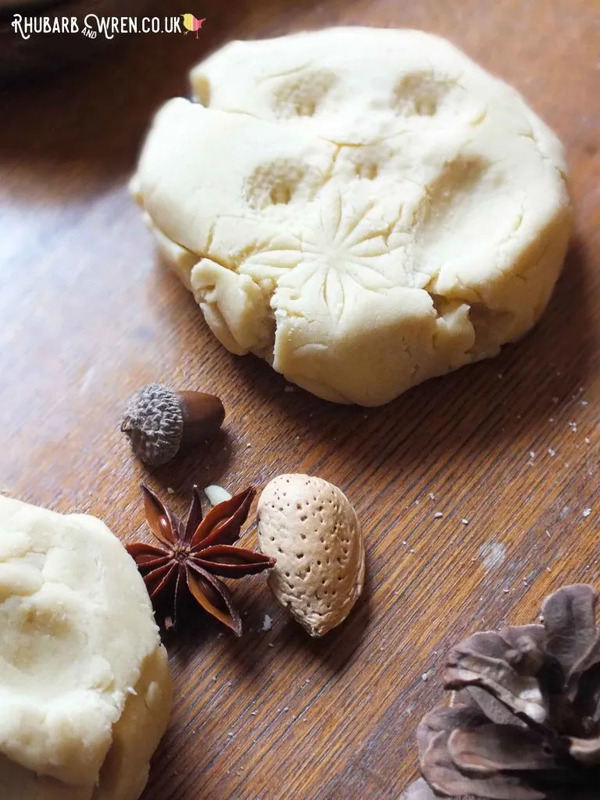 We bring back all sorts of treasures from our adventures out and about that – as long as they are clean or cleanable – can be used with the dough. 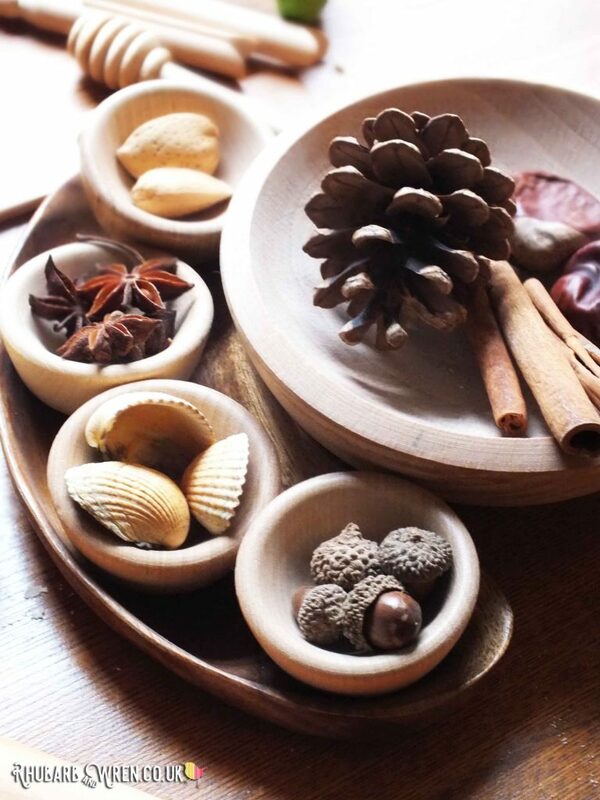 Pinecones, acorns, conkers (and their spiky shells), shells, stones, sticks, seeds and nuts of all sorts are great because they are hard enough to be easy to print with, but don’t overlook leaves, herbs and flowers for scent, colour and more subtle pattern making and decorating. 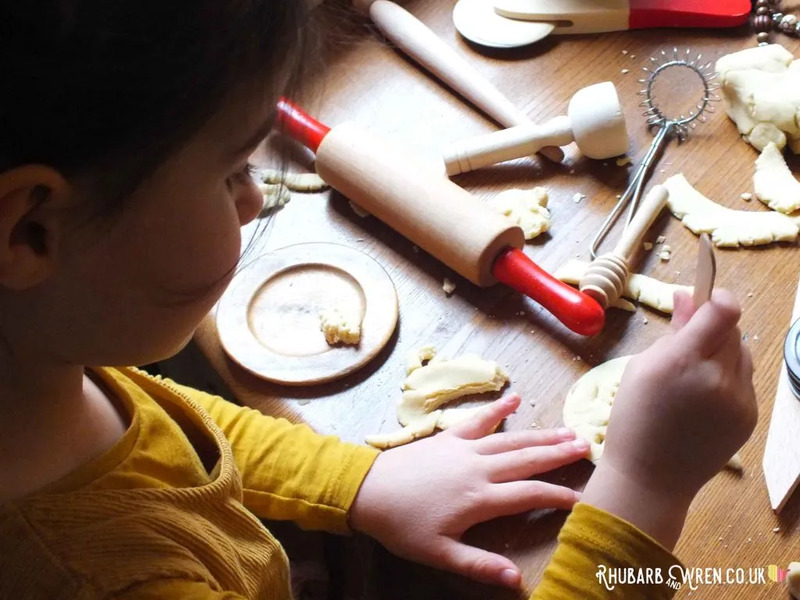 The vast majority of things in our plastic-free play dough box are things that we have repurposed for play – their original uses were often very, very different! But of course there are a some non-plastic tools, accessories and toys made specifically for play dough. 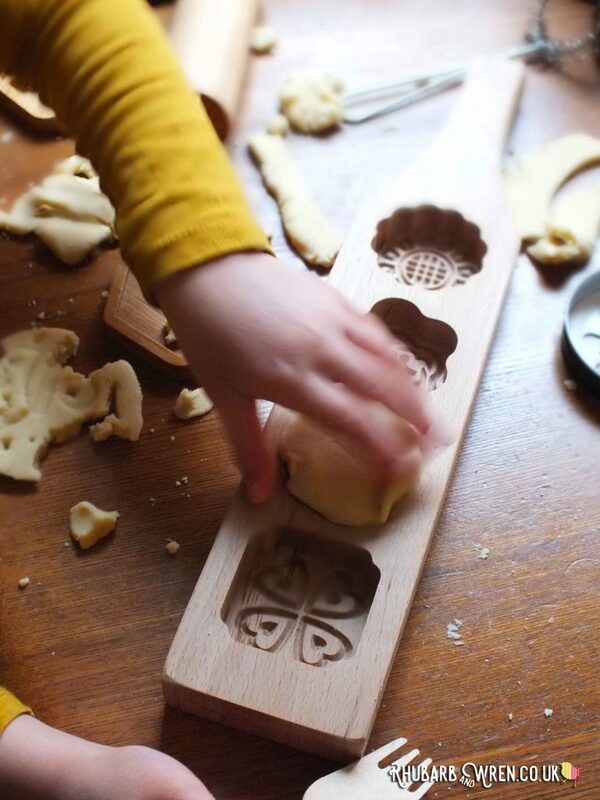 Our favourites are probably these lovely wooden pattern stampers, but I also have my eye on a set of little textured rollers for the kids too. See the supplies list below for details and (affiliate) links on where to buy these. 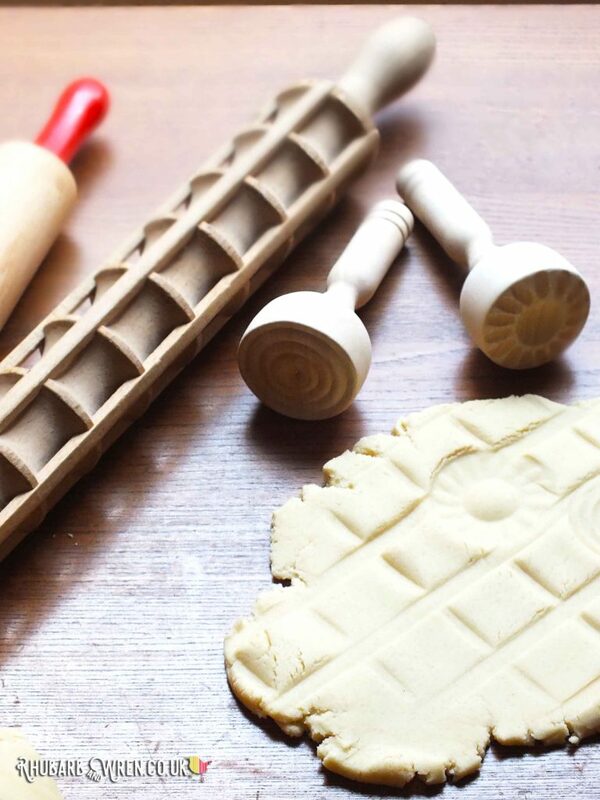 Wooden play dough stampers and roller that make great patterns. 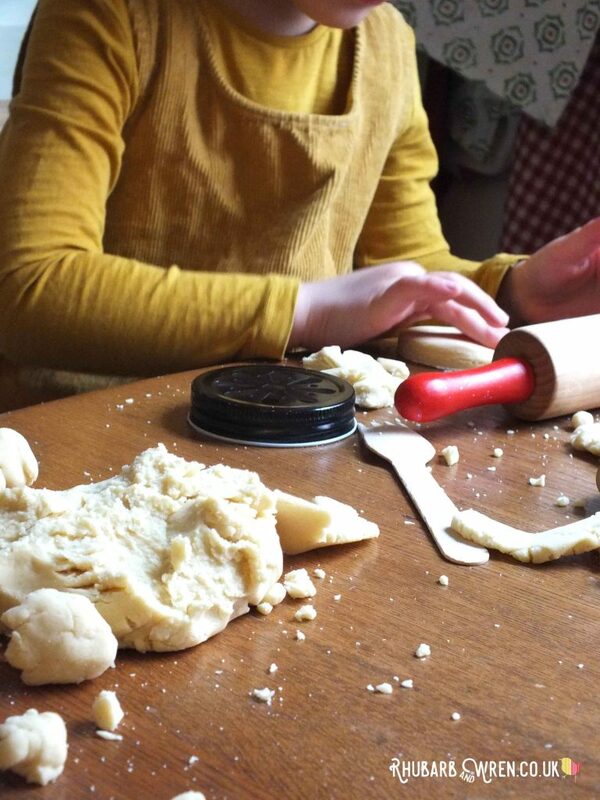 You and the kids can have great fun hunting down different everyday objects to use with your playdough – so many things found around the house (and out in the garden) can be used to cut, stamp and shape your dough. However if you want to buy a few tools and toys to get you started or add a bit of variety, it is possible to get non-plastic items to supplement those ‘found objects’ you’ve gathered. Here are some examples from Amazon of the types of things we use. These are affiliate links, which means that if you click through and buy, I will receive a small amount that goes towards the running of this website without costing you a penny extra. 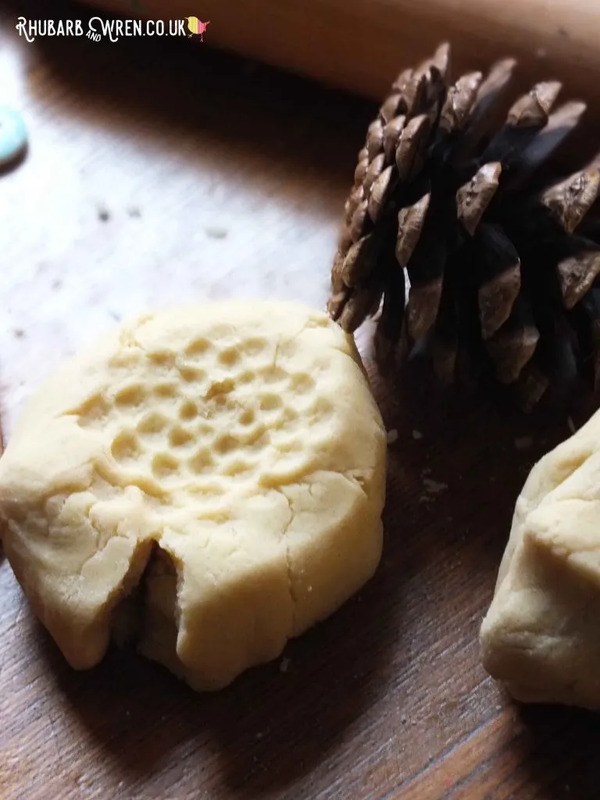 If you are looking for a quick and easy play dough recipe that the kids can help you make, look no further than our DIY Play Dough for Lazy Parents. It’s so simple, you can whip up a batch in minutes and yet it will keep (stored correctly) for months! If you are looking with more plastic-free activities to do with the kids, check out some of my nature craft posts for lots of ideas that are fun, frugal and stuffed full of natural materials! 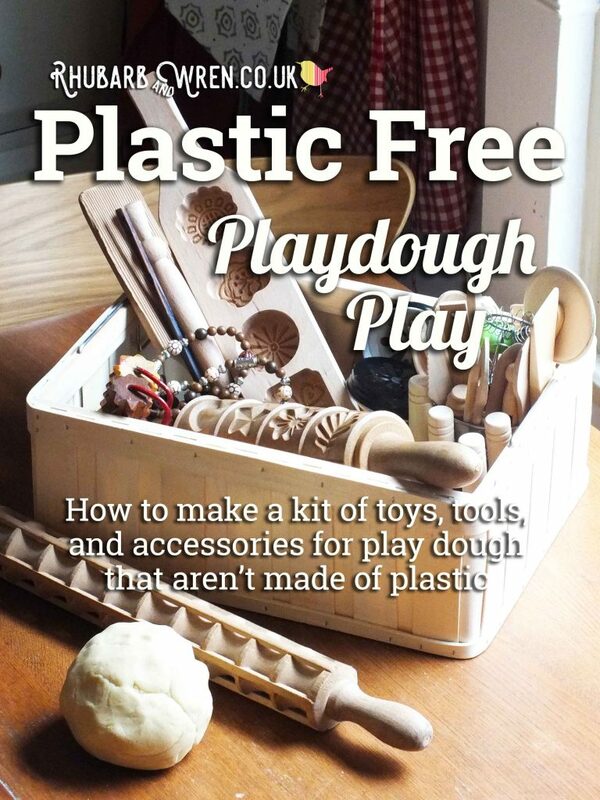 Nature, Plastic Free, Play Dough. Bookmark.